The country is in the midst of a solar revolution. A new solar-powered bus is rumbling through the streets of New Delhi, but it’s not picking up any passengers. Instead, it’s passing on the value of solar power. 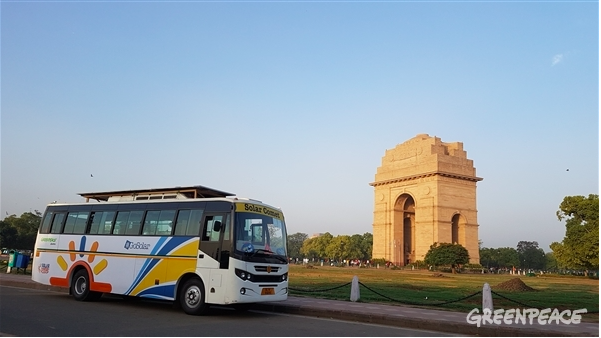 Greenpeace India collaborated with the city government to create Solar Comet, India’s first solar powered bus that will embark on 20-day educational tour to clear up misconceptions about the solar energy. The country is in the midst of a solar revolution — it already boasts the world’s biggest solar plants and plans to only sell electric cars by 2030 — but a lot of citizens aren’t fully on board because of confusion about costs, maintenance, and viability. Government subsidies and decreasing costs of solar panels have made powering Indian homes by sunlight affordable options. But unless citizens adopt solar themselves, the nationwide project for sustainability will fail. So the bus is making pit stops throughout New Delhi to give 30-minute informational sessions about solar energy and its ease and effectiveness. The bus also has LED lights, an air conditioner, and a refrigerator to showcase all the appliances that household solar can potentially power. So far, the response has been overwhelmingly positive. “We now know it is a good time to install solar power on rooftops that can pay back financially in four to five years’ time,” one Delhi resident said. Dyal Singh University, located in south Delhi, was the first institution to embrace solar energy. In 2016, Dyal Singh passed inspection and was granted a 15% government subsidy for the project. Not only will the solar panels reduce University electricity costs by 30%, but it will also deliver power to residential homes in the surrounding area. President of the University, IS Bakshi, says part of the reason the panels were installed was to “help others” who suffer from lack of electricity in the summers. Popularity of solar projects, likes Solar Comet, are creating optimism that by 2022 India will generate 40% of its energy from non-fossil fuel sources, a feat that will exceed expectations set forth in the Paris climate agreement. Between 2015 and 2016, global carbon emissions saw no significant growth, while India’s carbon emission grew by 5.2%. The Indian government has already taken significant steps to reduce its carbon emissions, and now ordinary citizens are doing their part as well.